On this month's Blogging Advice I'm gonna talk about something that gets a lot of flak - Scheduling. And I'm not talking about when you schedule one or two posts - it's when you've got month's planned ahead of time. If a topic comes up that you've like to post or speak about first, you can always reschedule! Moving a schedule around the moving your posts around is not as hard as it seems - heck maybe you can even post off-schedule. *gasp* Bonus post! These extra bonus posts can also help your schedule if you're currently going through a bit of a dry-spell. This is def a piece of helpful advice when you are working with brands and you schedule more than a month in the future: Let the brand know. Most brands like at least a tentative date in which their product will be featured. This keeps your relationship with them open and honest - which (when all's said and posted) leaves both of you with a successful post and a good working relationship. I say do whatever works for you. Sometimes I have things scheduled for a couple weeks and other times I'm doing it the day before. Scheduling ahead of time is always less stressful and allows me to focus on something else but I fall back into procrastination every now and then and thats ok too. As long as I like what I'm doing and happy with the finished product thats all that matters. 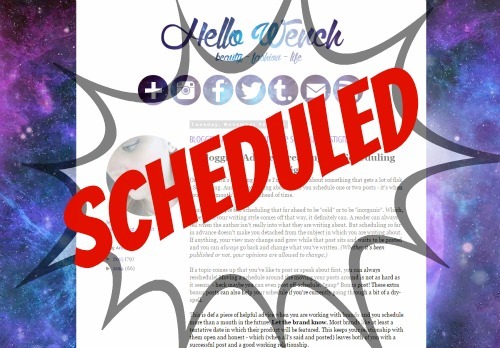 Scheduling is definitely helpful for those times when I've got major bloggers block - I find myself writing and finishing up posts a lot of times right before the due date! Being happy with the finished product is def always a work in progress though!